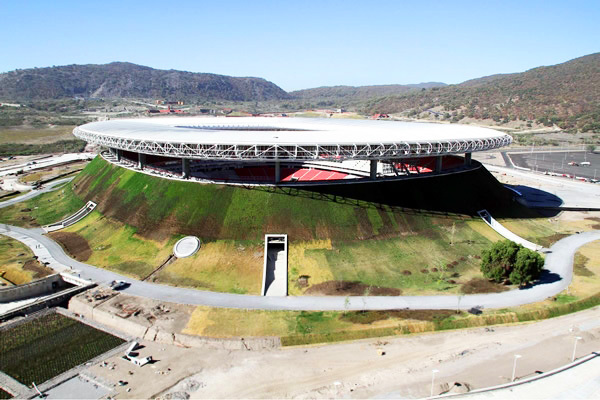 The city of Guadalajara has unveiled a volcano-like soccer stadium that is veritably exploding with green features. 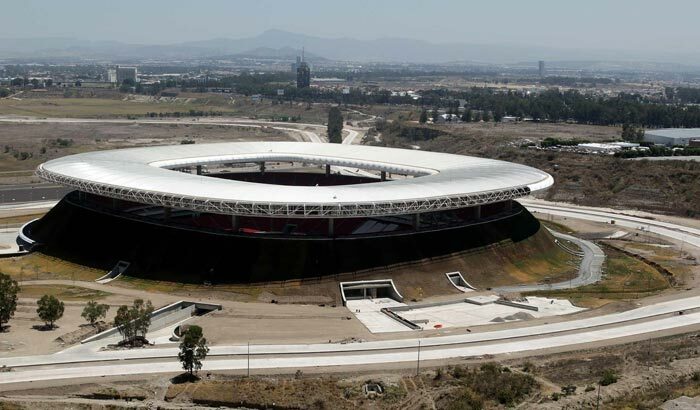 Created for the popular Chivas team by French architects Jean-Marie Massaud and Daniel Pouzet, the stadium features a volcano-evoking exterior that captures rainwater and processes it through wetlands for use in watering the pitch. All lighting is energy efficient, and the parking garage features natural ventilation. In a way, it seems our ability to create buildings that blend in with their surroundings is the ultimate test of our willingness to accept that we are part of nature. And, in Mexico — as in Italy — blending in means looking volcanic. One can reach it by bus, and car ingress and egress is carefully designed to avoid congestion as much as one can in urban Mexico. Nothing says blend in like the ring shaped UFO sticking out on top. Architecture aside. This is just another example of stadium madness. What we see is city after city building ever bigger and bigger stadiums. Wouldn't you like to have a stadium without the 150 million plus dollars it costs. It's reserved for team owners. In the U.S. us taxpayers get the bill. Pro sports team owners are richer than the athletes. I would think these are people who could pay their own way. Lobbyists & politicians tell voters stadiums will bring jobs and prosperity. But it's not true according to study after study done by independent economists (those that don't work for mayors and city planners). Mark Rosentraus, author of the book "Major League Losers" says the stadiums provide surprisingly few jobs for the costs their talking about. You would have done better by giving thousands of people 50 thousand dollars and ask them to start a business. And this idea that stadiums revive neighborhoods is a myth. All these bars and restaurants are largely gonna be open when the home team is actually there and they spend half their time playing away games. And these new stadiums actually make it worse for neighborhood business by having their own restaurants and bars and merchandise stores inside anyway. You're taking tax money from low or middle income people to help benefit the personal costs of some of the most economically privileged people in existence. If civic pride is justification, would I spend hundreds of millions of dollars to feel better about myself. Many team owners actually don't own the center, they claim it belongs to the people of the city; if that's the case why can't the public use it when the team isn't. Why not use it for Little League games and minor League ball. The award-winning study by UC graduate student Jack Sylvan found that the level of a city's economic activity was not affected by the presence of sports franchises, and it questioned the diversion of public funds away from unmet urban needs. This refutes the claim by professional sports boosters that sports franchises stimulate the local economy.